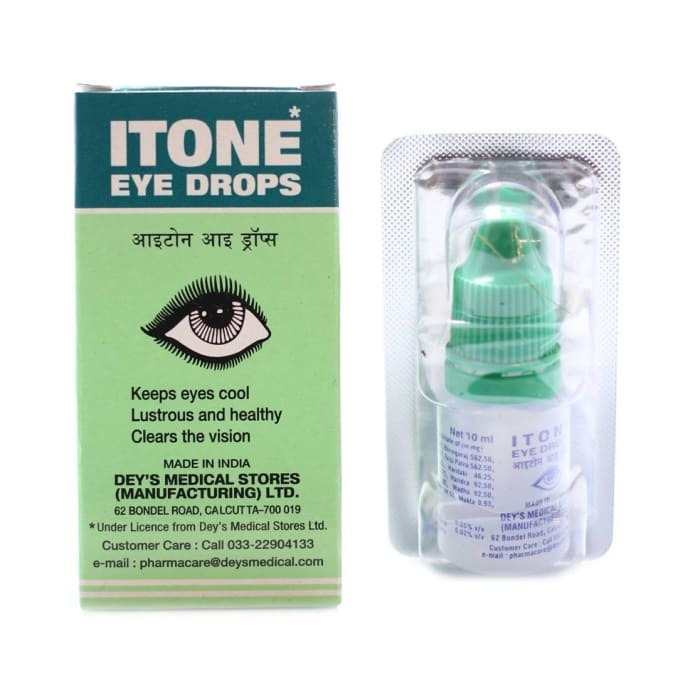 Itone Eye Drops is a potent formulation made from 20 herb namely Neem, Tulsi, Turmeric, Honey and many more extracts. It is a tayurvedic and herbal eye drops which help to rejuvenate and promote clear vision while protecting the eyes from continuous strain, glare, pollution & allergies. Basically Itone eye drops are sterile antiseptic solution and anti-allergy eye drops that relaxes and cools tired and dry eyes. They are also useful in pink eyes, conjunctivitis, swollen eyelid bump, stye in eye, eye strain, red eyes, tired eyes, dry eyes, watery eyes, itching and burning sensation in the eyes. Dosage: It is recommended with twice in a day application i.e. once at bed time and other after rising from the bed (morning). Warning: Keep away from heat and sunlight. To be used within one month of opening. A licensed pharmacy from your nearest location will deliver Itone Eye Drop. Once the pharmacy accepts your order, the details of the pharmacy will be shared with you. Acceptance of your order is based on the validity of your prescription and the availability of this medicine.